Aygul insists she's not really in the “Eid mood.” But that didn’t stop her from preparing a traditional Uighur meal for family and friends on this holiday at her home in northern Virginia. In between handing out bowls of homemade laghman noodles and cups of hot tea, Aygul tears up as she and her guests discuss the plight of their families back home in China’s far western region of Xinjiang. Uighurs in the U.S. came together this week to mark the Kurban Eid holiday, also known as Eid-al-Adha. Yet, as several Uighurs told VOA, it is hard to celebrate while knowing — or not knowing — what their relatives are going through. About 11 million Uighurs live in Xinjiang, a region that China has methodically turned into a police state, with block-by-block security checkpoints, sweeping surveillance technology and extrajudicial detention centers aimed at political indoctrination. China says it is trying to prevent Islamic militancy and separatism, and points to a series of deadly attacks between 2009 and 2014 that it blames on Uighur extremists. Earlier this month, a United Nations official said there were credible reports that China is holding as many as 1 million Uighurs and other Muslims in the re-education camps. Another 2 million reportedly are attending open re-education camps daily and return home at night. 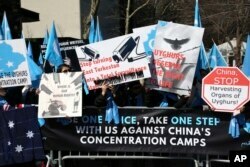 Uighurs and their supporters rally across the street from United Nations headquarters in New York, March 15, 2018, to protest a sweeping Chinese surveillance and security campaign that has sent thousands of their people into detention and political indoctrination centers. China’s efforts also have threatened many Uighur cultural and religious traditions, including practicing Islam and holding public gatherings. As a result, Uighurs living in the United States and elsewhere are eager to get together for holidays to pass on traditions to their children. Here in the Washington area, Uighurs continue that tradition at Aygul’s home. As friends stop by, it becomes clear that virtually everyone in the community has at least one family member missing, presumably having been sent to a re-education camp. To protect their families in Xinjiang, all of the Uighurs who spoke to VOA for this article preferred to use pseudonyms. VOA was not able to independently confirm their stories. But human rights groups and researchers have for years documented conditions that match these descriptions. They say the situation is only getting worse. A woman who wanted to only be identified as “Nisa” lost contact with her father earlier this year. Her father, a government employee, was neither political nor outwardly religious, Nisa said. She found out days later that while her father was in the hospital, authorities came to his room, put something over his head, and took him away, Nisa said. No one has been able to reach her father since he was taken. In Brussels on April 27, 2018, a person wearing a white mask with tears of blood takes part in a protest march of ethnic Uighurs asking for the European Union to call upon China to respect human rights in the Chinese Xinjiang region. Ilham, a young man in his 20s, knows of at least eight family members who are in re-education camps. But this week, he’s optimistic as he explains to his friends about what he believes may be a secure method to get news from family members back home. Talking to family in Xinjiang has become nearly impossible in recent months. The Chinese government, which denies repressing Uighurs, closely monitors everything that comes out of Xinjiang. Even mundane interactions with those living abroad can put Uighurs still in Xinjiang at risk. China’s intimidation campaign extends beyond Xinjiang, as well. Chinese authorities have begun pressuring families in Xinjiang to get their relatives living outside the country to provide detailed information about their daily lives abroad. Gulbahar has lived in the midwestern U.S. for the past year. She said Chinese government officials in March pressured her father to provide information about where she and her brothers go to school, their addresses, and when they intend to return to China. Gulbahar passed along the requested information, fearing her father's safety, she said. They haven’t spoken since March. Her phone calls and text messages have gone unanswered. On Eid, Gulbahar decided to send a simple holiday greeting to her parents over WeChat.